New security scanners are being trialled at Changi Airport Terminal 3 to boost security, amid a growing threat of terrorism against aviation. Travellers departing from boarding gates A16 to A21 at T3 are randomly asked to walk through body scanners, while there is also a new machine to screen hand luggage for those leaving from gates B1 to B4. With this new machine, travellers do not have to remove laptops, tablets and other devices from their bags for screening unlike now, said Changi Airport Group (CAG) during a media preview yesterday. Changi is one of only two airports worldwide, the other being Amsterdam's Schiphol, that is testing the technology. To improve the bag screening process, the machine comes with an automatic tray return system that improves efficiency and reduces waiting times by about 20 per cent for passengers, said CAG's vice-president of aviation security Alan Tan. Trays are presented to two passengers simultaneously at the start of the screening belt, so both can deposit their bags at the same time. Bags that are cleared are channelled to one lane, while those that need to be manually checked are diverted to another. The trays are automatically returned to the line after each screening cycle is completed, so security officers do not need to manually return them to the start of the line. Said Mr Tan: "More often than not, enhancements in security checks increase inconvenience for travellers but here, we are able to make the system more robust while reducing hassle for travellers." Meanwhile, the new body scanner is the latest to be tested after three earlier trials by Changi. Not many airports - apart from those in the United States, Europe and Australia - have introduced the machines, due to issues such as privacy concerns and potential health risks. To mitigate such worries, the body scanner now being tested at Changi Airport does not detail the actual person's shape, Mr Tan said. If a traveller walks through and no alerts are raised, the monitor turns green and no image is produced. If an item is detected, a simple outline of a body is generated to indicate where the object is. The scanner uses millimetre wave technology to detect both metallic and non-metallic items. The technology has been certified to be safe and poses no known health and safety risks as it utilises a very low-power non-ionising form of electromagnetic technology, CAG said. The amount of electromagnetic radiation emitted is many times smaller than that emitted by a mobile phone, it added. The trials started last month, and will end in June. Thereafter, data and passenger feedback collected will be analysed to help the airport assess the new systems. Business analyst Damien Wong, 41, who travels once or twice a year, said: "Security is paramount given the threat levels, so steps taken to make flying safer is a good thing. 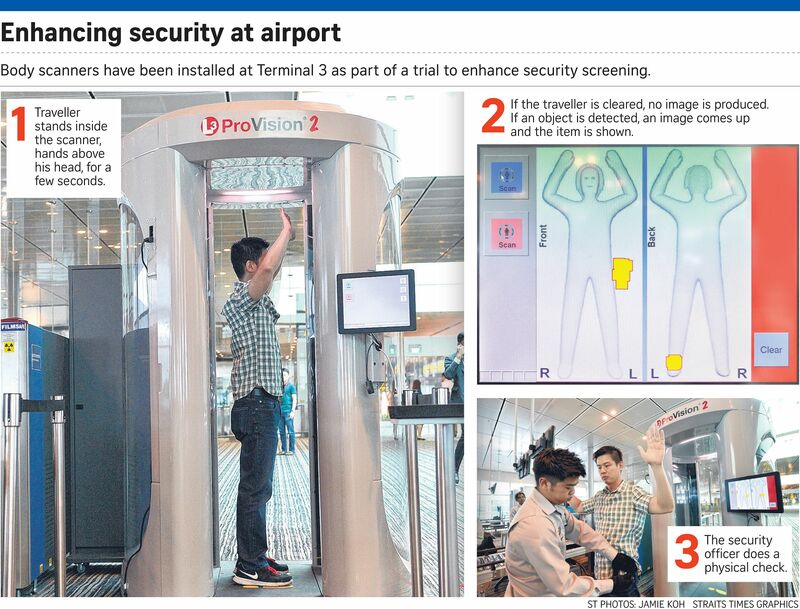 "The hand luggage screening method that Changi is testing sounds really good. It's really a hassle having to remove laptops and other devices."